Knowledge Hunter: How to launch a satellite to orbit? Discovery Channel is the place to be when you want to stay in and learn something the easy way, cosy laying on your couch. Well, doing so, I learned something about building rockets to launch satellites to orbit. The programme addressed some issues the Japanese were facing during the build of the HII-B (H2B). Japan launched its first satellite to orbit with licenced American rockets in 1970. Since then they chose the path of liquid fueled rockets as launchers. Leading to the first successful launch of a satellite to orbit in 2005 with the H-IIA rocket. 35 years of development! In 2004 they started developing the H-IIB rocket. This rocket is much larger able to carry a much heavier payload. 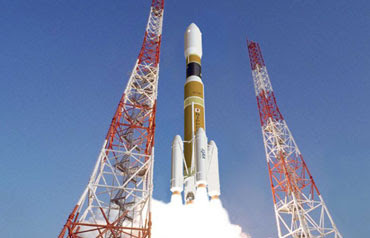 The aim of the rocket is to carry the H-II Transfer Vehicle, or HTV. A robotic spacecraft intended to resupply the Kibō Japanese Experiment Module (JEM) on the International Space Station, and the rest of the station, if need be. Scheduled to be launched in 2009, carrying 16.5 tons. 35 years kept me busy for a couple of days. 35 years spans a full carreer of a space engineer, I guess. So quite some engineers joined and retired during those years. How do they ensure knowledge and experience is retained? In this domain a failed launch means years of delay and millions down the drain. You can't just launch another one the next day... Since 2004 they invested €150 million ($150 billion).